100 percent cotton fabric with colors including blue, brown,yellow, red, gold, brown and green. This fabric measures 45 inches wide. A fun and whimsical fabric for all ages. 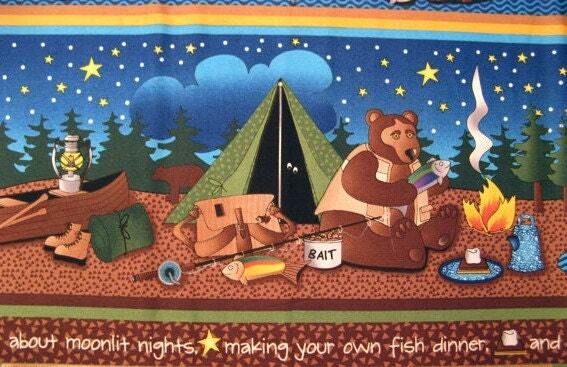 You can smell the campfire and marshmallows roasting as the whimsical bears are sharing their stories around the campfire. This fabric is linear but lends a host of ideas. This fabric can be fussy cut and turned into a fun quilt. 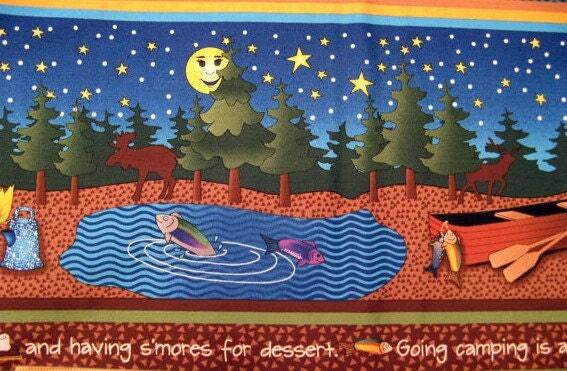 What camping enthusiast wouldn't want a fun quilt to snuggle under while roasting hotdogs and marshmallows! All fabric from The Quilted Nursery is cut directly from the bolt and sold by the yard. If you require special yardage please contact The Quilted Nursery and we will be happy to accommodate your request. Same day shipping Always! great! fast shipping! thank you!